I am starting a new cosplay theme. I am not into anime anymore and rather sew something pretty instead of wanting to be the "character". This is the reason why I did so many Sakizou cosplays over the past years. But now I want to do something else too, and my theme will be historically (more) accurate Disney costumes. 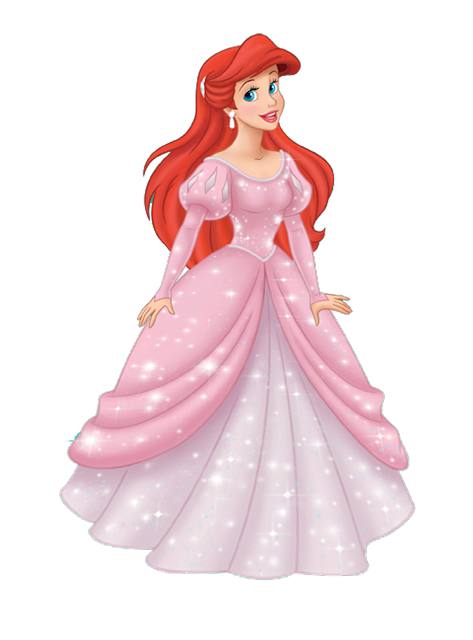 I wanted to start with something easy like Aurora but then I thought about doing Ariel because I could re-use the dress for a Biedermaier festival in May. That is, if I am finished until then. Haha. The corset, a tutorial for puff sleeves is coming in the next post. I will concentrate on the dress only. This is the official artwork for Ariel. The bottom picture is from the movie. Her red hair is loose and clipped on one side with a white or silver hair clip. 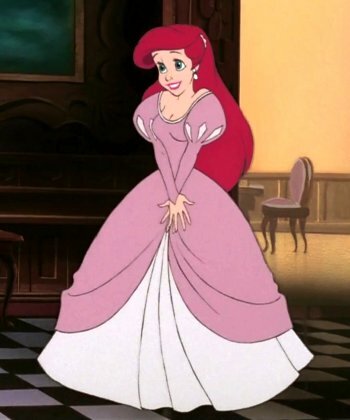 The dress is pink with a white under dress. It has a very bell shaped form. The collar is very round. The sleeves are long and wide and very puffy on top. They also have slits and you can see the white fabric underneath. I researched the form and everyone on the internet had different opinions on the country and time. Shoomlah on Deviantart set her in the 1890s. I agree with her on the sleeve part but not on the dress part. In the end I went with a 1830s look because that was not only the look which striked me as most similar but also because the book "the little mermaid" by Hans Christian Andersen was published in 1837. 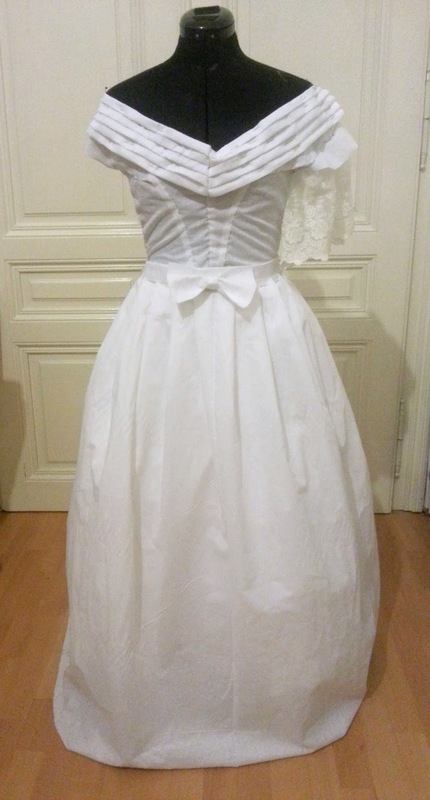 And I think the gigot sleeve and the shape of the dress fitted perfectly. 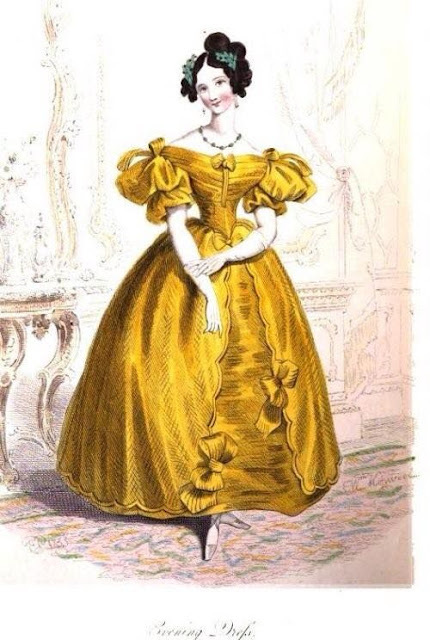 1833 La Belle Assemblee, evening dress. 1833. 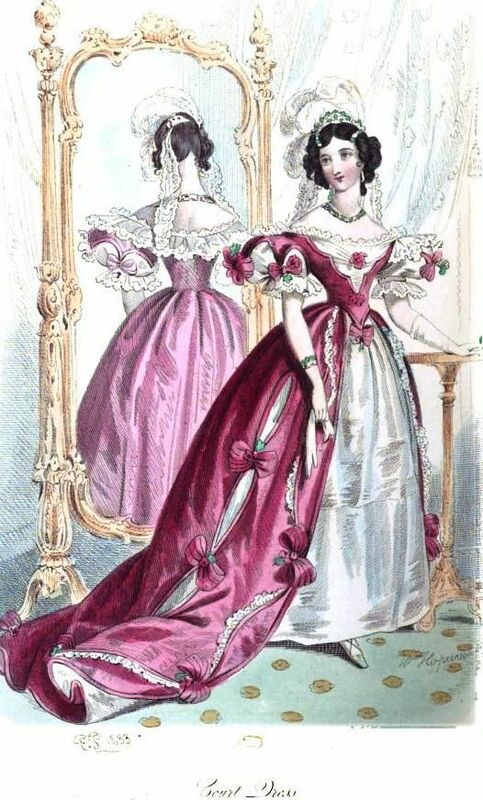 Court dress, La Belle Assemblee, May. So with the 1830s in mind and a janet arnold book in my hand I set to work. And she grew fat. She looks like a huge hairy ball now. My first mock-up worked out well, except for some small details of course. 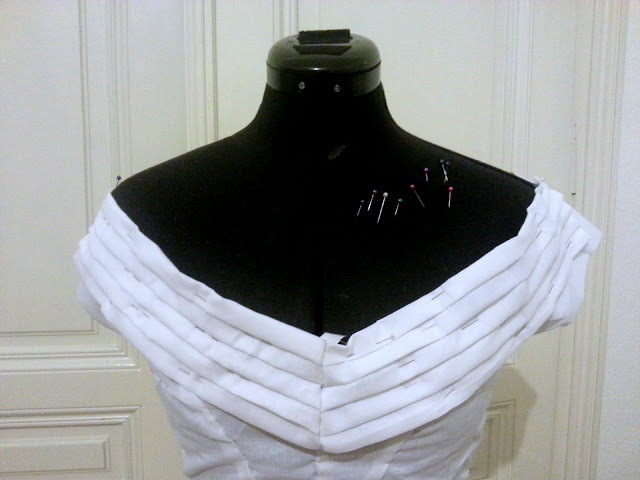 I had to make a dart at the front but there were no darts on the pattern, so I cut my pattern differently, leaving out the dart on the finished top. I also changed the sleeve part and set it furter down. I added a pleated bertha to it because I thought it would look nice. 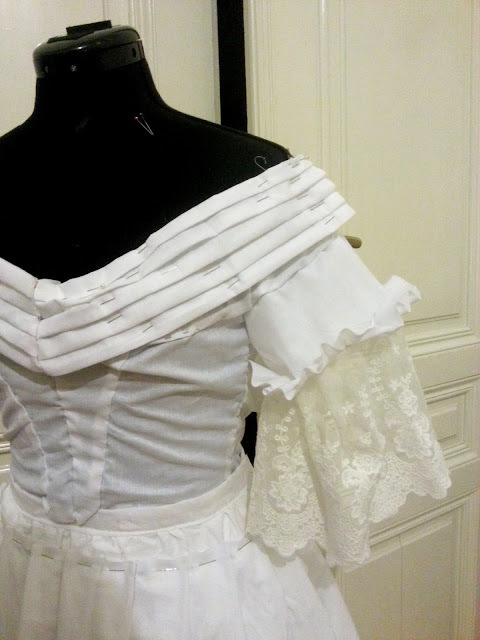 At first I went for these tiny sleeves because in 1837 the sleeves got thinner again. 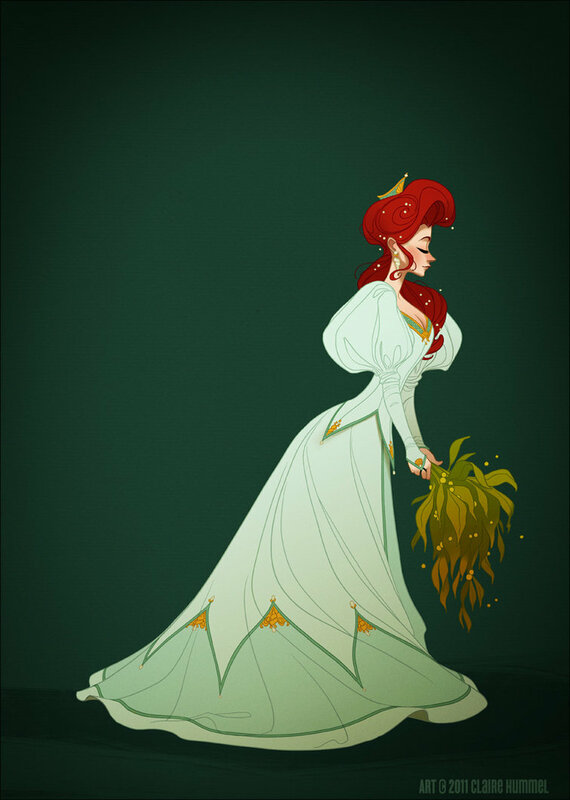 But I tossed that idea and instead made the dress more like the disney version. 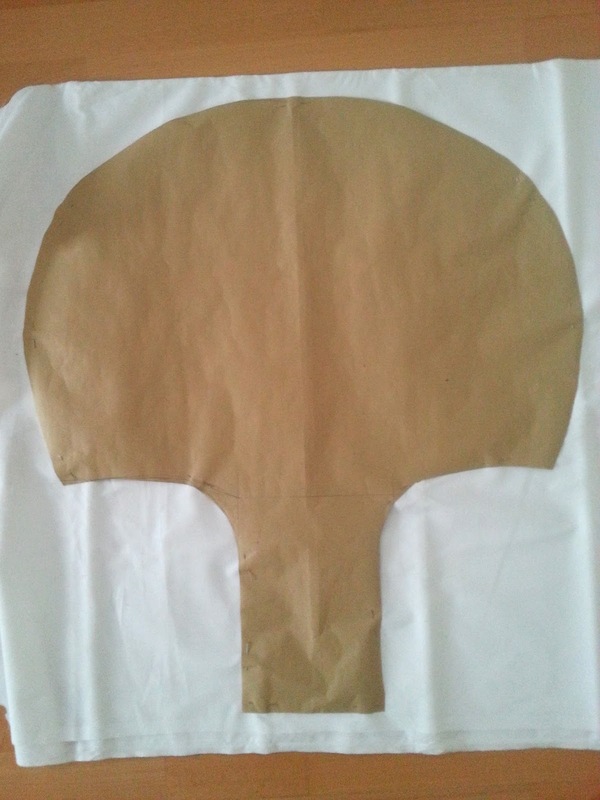 The skirt part was just one huge rectangle but I just had luck with my fabric because the width was about 3m. With my other fabric I will have to cut it in two or three parts. The skirt has knife pleats and at the back cartridge pleats. I made the skirt as instructed in the Janet Arnold pattern book. 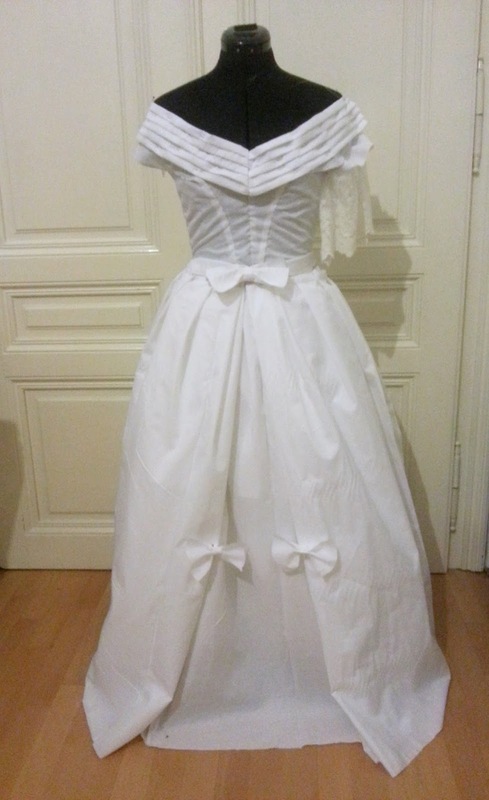 The underskirt, and ignore the small bows, is made out of knife pleats too. I am still not sure how to close it because I plan to do it as a whole dress instead of top, skirt, overskirt but I am not sure how to proceed here. I only have one picture of a fashion plate (saved from mimi matthews, a fantastical blog) where the back is depicted too. Die Mode, Menschen und Mode im neunzehnten Jahrhundert, 1837. But I'll try and figure out something and do some research before cutting the "real" fabric. After this part I put the dress aside for a few months. A week ago I once again draped it over my sewing doll. I changed the fit and decided to go for the gigot/leg of mutton sleeves. I drafted the pattern after Janet Arnold's book again and got the length correct...but not the width. So I made the button part longer and added a few centimetres to the curves. 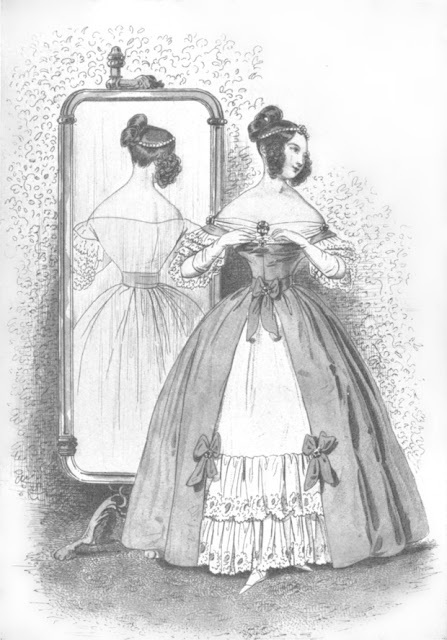 The whole dress is draped over a underskirt, a corded petticoat and a starched frilly petticoat. I am not sure if I am already happy with the form it gives. 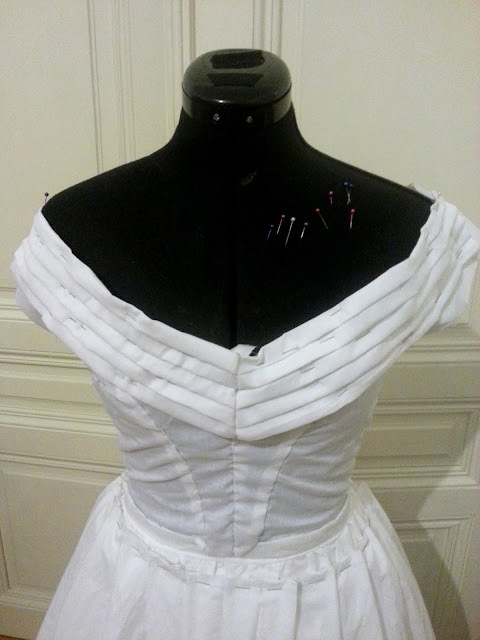 Maybe I'll do another starched petticoat? Also ignore the waist band, I decided to go for another one. The bertha is held in place with all that pins but I decided to make a new one, just for the pictures. The gigot sleeve already looks very puffy. I folded up the skirt part because they were not that long anyway plus it had the perfect length now for the seam. And a close-up of the top and bertha. So how do you like my mock-up?